This is beyond adorable!! I'm sure the plaid was a pain to deal with, but I think the nubby texture it has is the perfect complement for the glossiness of the rest of the chair. Kudos to you for such great work! This looks SO sweet, love it! But you've kinda scared me.. I have an upholstery project that I need to get started on soon..
these are great pics of Chloe...and I love how the chair turned out! Precious. This chair turned out absolutely adorable! And Chloe? Well she is a more and more beautiful each time I see her! Can't wait to see what all you do for her big bday! If that is not the cutest little chair for the cutest little girl? I don't know what is. You did a great job! It's looks like she loves it. This is an heirloom piece for sure. Oh boy...these are sooo ADORABLE! The Chair looks amazing! I adore the fabric, and Chloe is too cute sitting on her little throne. Great job! That looks so adorable , those strips sound tricky indeed to me . My goodness Chloe is growing quickly , just like they always do . The chair turned out so good!!! Yay! And awww! 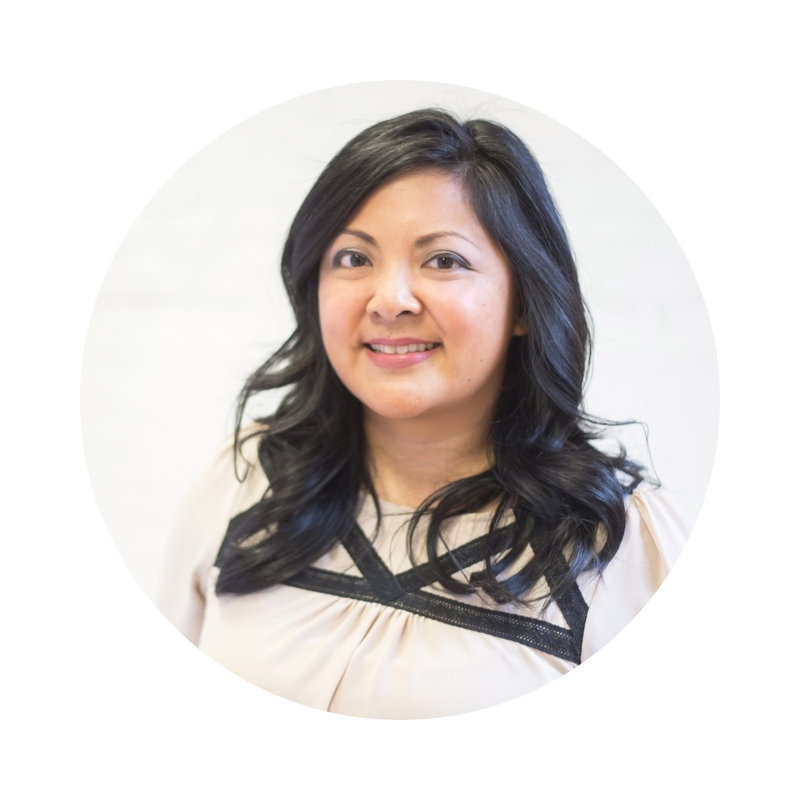 Look at my favorite little blog bebe! ADORABLE!!! ... well worth two bloody fingers. What a beautiful chair for a beautiful little munchkin! :) Those last few shots of her with the chair are too precious - she has such a beautiful smile! I hear you on the stripe thing! The tables & chairs in our kitchen were my Grandmother's old dining room set that we restained & reupholstered. My Mom started the slipcovers & then her and I had to change the whole idea and reupholster all the chairs together... in a bold stripe I picked - bad idea! I'll have to share a post on them one day! DARLING! Just darling. Love it! Chloe is just too cute! Great job on the mini chair! OHHH MAAAa GOOONESS GRACIOUS! Where did you get such a delightful chair. ANd I think your lovely LOvely little lady is so lucky to have a momma that took the time to make such a wonderful treasure! I LOVE it so much! Chloe looks adorable in her refurbished chair!! Great job! Congratulations! 8 months? Almost like a pregnancy! You have birthed (well, re-birthed) such a charming finished product. I love that chair. I can tell that cutie-pie Chloe does too. Her expression when she perched in it 8 months ago versus her smiley face as she poses with it now says it all: Well done, Mama! That chair is super cute, even cuter with Chloe in it. The color you chose is awesome, along with the upholstery fabric, even though it was a pain for you to use. It turned out really well. Love how the chair turned out, but she completely out starred it! OMG, what's changed is now she doesn't sit still! I love it. It's wonderful and darling. She is a doll! The chair looks awesome! Fantastic job! This is the cutest chair ever- great job. I love the color of the wood with the fabric. She is going to love this chair as she grows. LOVE IT! Gorgeous chair and even more gorgeous baby! What a lucky girl Chloe is to have such a beautiful chair. How cool! And that color is gorgeous! Oh, I just love this. I love the color you went with too, the blue is perfect! What a precious little one as well. That is just the cutest chair ever! This is just so utterly and completely adorable; both the precious, cutest little baby and that cutest ever little chair! 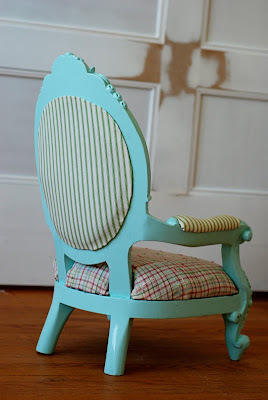 What a fabulous makeover for that little mini chair; the colours the fabric..,perfection! Do feel welcome to visit my blog as well anytime! Wow, that chair is so cute and so is Chloe! It looks so much better painted that color! The results were well worth the effort! Your mini chair make over is adorable and little Chloe is even cuter! Holy smokes - does that chair look amazing! What a find and what a great job you did! Love the way the chair came out and love the sweet little faces! That is such an adorable chair. I am getting ready to reupholster some and am so glad I stopped in here today. It's nice to have some tips! Your poor bloody fingers did a flawless job!! A mini chair fit for a mini princess. The only thing more darling than the chair is Chloe. She's such a busy bee! I.LOVE.THAT.CHAIR. That is one amazing chair. You did a great job. And Chloe is a doll! That is the cutest chair and I love the fabric you chose! Chloe is so cute playing on it too. Thank you all for the comments :) And if I can reupholster, anyone can do it! Emma - I always start with picking fabric for inspiration! The chair looks great! Chloe is very cute! And i'm also hoping for a post about the panelling i see in the background. Roncie Vic - you have an eagle eye ;) We'll definitely be doing a post about the panelling once the bedroom is finished. Always love to meet a fellow Canadian blogger! Love this chair ~ from the color to the fabric to the size! You did a great job! The babies are the icing on the cake! I'm wondering if it took you half the time (or less). love the fabric choice - great job! SO Cute! What color/brand is that paint? 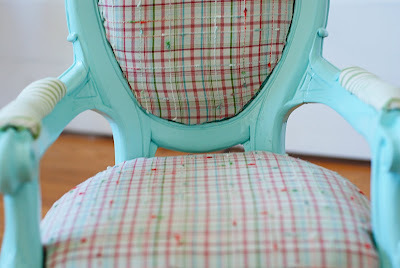 I think these are the cutest chairs ever.. Love the colors and fabric choice. Well done! 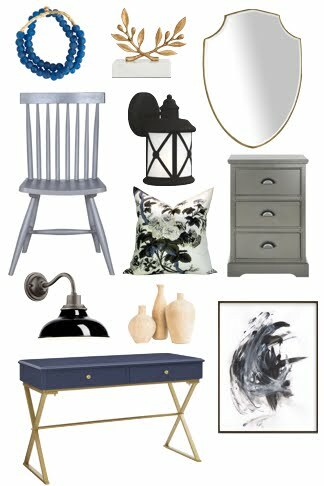 Wendy - the paint is Balmy Seas 490C-3 by Behr. That child is cuter every time I'm here, and the chair isn't too shabby either. WOW, this chair is amazing. I am visiting from CSI projects. I love the colors and the style is great. I am a new follower! this is the cutest chair ever--I'm so jealous! Adorable chair! What a great job. Too cute & well done!